“That’s just the culture here. We can’t get anything done quickly.” Organizational culture has gotten a reputation for being difficult to unravel and nearly impossible to change. Is your organization’s culture really a trap you can’t escape? That’s up to you. Culture: v. To maintain (tissue, bacteria, etc.) in conditions suitable for growth. Culture is what you do, not who you are. Attitudes. Behavior. Conditions. Groups. That’s what culture is. If the behavior that is characteristic of your organization is getting you down, make a tiny change in one of the above 4 elements. Here are three examples. She didn’t quit. Instead, she placed a small table in a central location with a message board above it. Soon food started appearing there – lemons from the tree in someone’s backyard, tomatoes and zucchini from someone’s garden, a box of doughnuts. Then notes started appearing on the message board. As people lingered to eat, they talked and joked with one another. The fighting subsided. The meeting was the same every month: There was no project goal, no meeting outcome, no agenda. There was only a plate of cookies and a request by the CIO to figure out “how to create partnerships between IT and our client groups.” This group of senior managers ate cookies and went through the motions for 9 months. They’d meet for the rest of their lives because the culture did not allow pointing out the mistakes of leaders, and it did not believe in structuring meetings. A newcomer suggested a meeting evaluation, and it took 3 flipchart pages to capture their discontent, and only 2 more highly structured meetings to agree to stop meeting, a first in this compliant, meeting-bound culture. “We can’t solve on partnership problems in isolation.” is what they told the CIO. “Makes sense,” he said. “…so we need a new design for the group by Friday. I need your very best thinking..” It was Wednesday afternoon and this was the first I’d heard of this from my C—level client. It was a typical moment in this hard-driving, last-minute culture. I was booked solid for the rest of the week. I tore out a piece of paper from my pad and started drawing the design. “I can do it right now,” I said. She frowned as I drew and labeled boxes. “Why are you putting that there?” she asked. 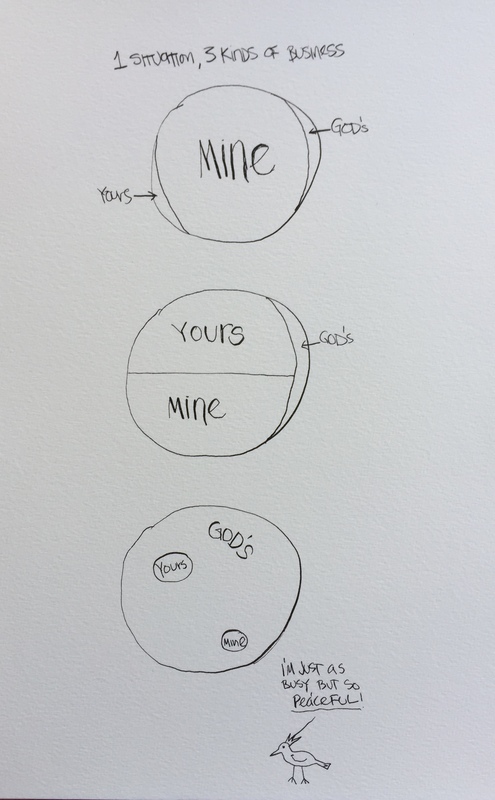 Then she grabbed her pen and pulled the paper toward her. We had an engaging design session for the next 15 minutes. When culture is in your way, it’s tempting to think you have to make a dramatic attempt to change it. What if, instead of trying to change the culture, you focused on not letting the culture change you in one, tiny way? Just because the office layout is unfriendly doesn’t mean you have to be. Just because the meeting culture is dysfunctional doesn’t mean you have to throw away your skills. If the deadline demands are routinely impossible, why not make a first draft part of the way you work? Just because the culture is rigid, doesn’t mean you have to be. Remember: Right here, right now, the culture is up to you. Giving feedback is not an excuse to belittle someone, yet it’s so easy to cause harm. A simple formula will keep you from crossing the line. Yes, he did. Speeding is a behavior; something you did that was wrong. Being a reckless driver is something you are that is wrong. Real feedback is about the behavior, not the person. Jacqueline and I are talking about the equine-guided leadership program at the Stanford Red Barn. A horse named Chey is standing with us, looking me in the eye as Jacqueline talks. When I begin speaking, Chey takes 2 steps backwards, still locking eyes with me. I say “No? Not the right direction? OK. Forget that.” Chey immediately takes two steps toward me and wiggles his ears, then blows snot all over me. We have to take a tiny hilarity break before we can go on with the meeting. He stayed connected to me, both when he was stepping away from me and when he was stepping back toward me. He gave feedback instantly, without agonizing or creating a story about why I was being such a chowderhead. He didn’t call me a chowderhead. 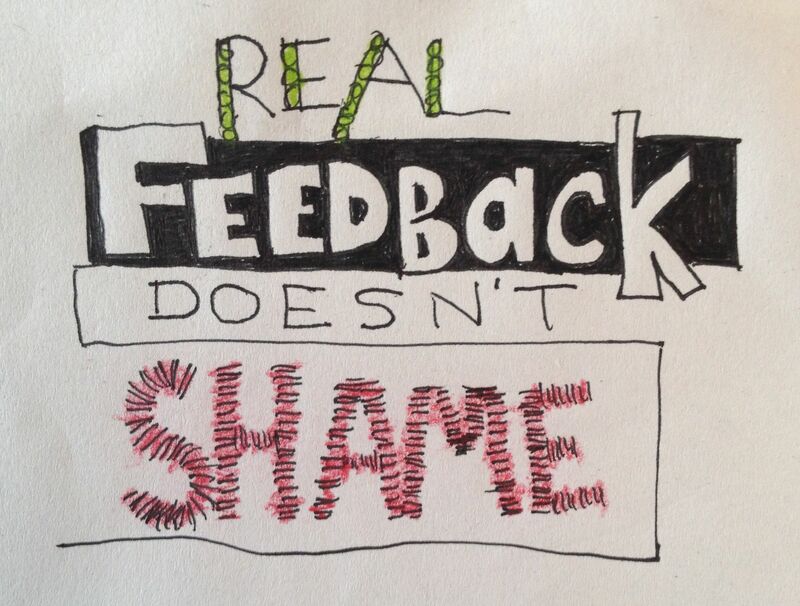 Feedback that works is feedback without shame. Horses excel at this. Horses simply respond in the moment without judging either their response or the person or horse they are responding to. Horses are OK with having likes and dislikes, and letting each other know about them. Horses accept feedback as a way of life. Humans like to “improve” the feedback they’re about to give by first disowning it, then telling themselves a story about it. Rather than admitting to our own anxiety or irritation, we create stories that make it easy to blame our feelings on others. Then we blame them for forcing us to give feedback! “if you want to succeed in this company, you’ll watch your tone.” That’s a world apart from “You sounded cranky to me yesterday. It rubbed me the wrong way.” The second example lacks shame; the first is drenched in it. The story gets in the way of the simplicity and directness that makes feedback effective. The story obliterates the connection that makes feedback safe. The story shames the receiver, which forever blights the relationship between them. Feedback + a story = shame. The feedback you give tells others what you care about and something of who you are. Building a case for the righteousness of the feedback you’re about to give is like the Wizard of Oz terrifying Dorothy before she spots the man behind the curtain. But it’s the man behind the curtain we want to hear from, person-to-person, because getting feedback makes us vulnerable too. Who are you without your beliefs, certainties and authority? You’re a human being with endearing quirks, annoying habits, staggering talents and persistent blind spots, just like me. Nothing real separates the person giving feedback from the person getting it. Nothing. Who are you without a 360-degree review process that institutionalizes gossip, or a performance review process that forces you to find “weaknesses” in perfectly wonderful people, even though every bit of research supports focusing on strengths instead? You are a human being caught in an organization that sometimes causes you to act like you’ve lost your way. But you haven’t, have you? There’s an ancient formula that helps us human act more like horses. Its earliest appearance is in the Upanisads, the mystical texts of Hinduism. It’s most often associated with Socrates now, and is a threefold test for speech that is beneficial for the speaker and the receiver. You need all three of these to pass the test for effective feedback..
1. It’s true. True is what is real about this situation – everything that’s real. Let’s say you have an employee who casually mentions that they’ll be working from home for the week between Christmas and New Years. Let’s say “home” is in Colorado, where they’ll be visiting family over the holidays. What’s real is that working at home has to meet two criteria: There has to be a valid business reason for doing it, and it has to be approved. What’s also real is that you are supportive of telecommuting in general. The most real thing you can say about this is that you are stuck on the horns of a dilemma. If you start there, I bet you can work out something that satisfies the employee, the organization and you. If you making a case about how insubordinate or entitled they are because you are stunned by this obvious attempt to pass off vacation time as work, you are adding a story to the truth and you will shame your employee. The truth is what actually happened in the real world. The story didn’t actually happen. You made it up. Effective feedback is the truth without the story. 2. It’s kind. Kind is from an Old English word that means kin or family. It carries the sense of “deliberately doing good to others.” In order to deliberately do good to someone, you have to open your heart to them. Where doing good to them seems to conflict with doing good for the company you represent, you’ll need to open your heart to yourself. It’s OK to feel uncomfortable with the discrepancy between what you want to do and what you must do. Everybody deserves kindness. Make the circle big enough to include all three of you. 3. It’s useful. Useful for the person receiving the feedback. You’ll know because they will get very interested in what you are saying and show all the signs of someone who is learning: bright eyes, talking faster, and a vocal tone full of color rather than a dead monotone. True, kind and helpful: It’s your insurance policy against shaming others as well as being shamed into being less human than you are.